BOLD MONKEY: New Release: Charles Bukowski Storm for the Living and the Dead: Uncollected and Unpublished Poems, Edited by Abel Debritto (Ecco, 2017) Hardcover only, 272 pages. New Release: Charles Bukowski Storm for the Living and the Dead: Uncollected and Unpublished Poems, Edited by Abel Debritto (Ecco, 2017) Hardcover only, 272 pages. Unsurprisingly, Ecco has unearthed more errant stubble from Buk’s spent writing ashes. This most recent internment by scholar Abel Debritto, will be released on 7 November 2017 in a hardcover edition. If previous Ecco publications are any indication, this book will probably be a further watering down of Bukowski’s work and perhaps another posthumous kick into the balls of his reputation as an artist. 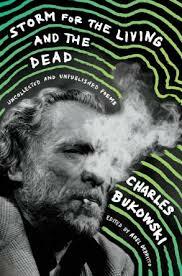 We need to consider, however that Bukowski wrote so much undocumented material during his lifetime. He posted hundreds, perhaps thousands of poems to small publishers without keeping carbon copies or accurate records of what went where or to whom. Several hundreds of poems/ stories were never returned or were eventually lost or stolen. Has Debritto sourced some more of these? A source within Bukowski.com reckons Storm for the Living and the Dead consists of 72 previously unpublished and 26 previously uncollected. Black Sparrow Press editor John Martin published most of Bukowski’s best work during his lifetime but continued to edit and churn out more of his stuff over a dozen or so volumes for Ecco after Buk’s death in 1994. Debritto has edited recent publications, such as, Bukowski on Writing (2015), Bukowski on Cats (2015) and Bukowski on Love (2017). On Writing gathers together some of Bukowski’s previously uncollected letters about writing whereas the other two books collect Buk’s previously published work on the themes of cats and love. These are excellently researched books but not as interesting, nor in the same league as the City Lights publications, edited by David Stephen Calonne, such as, Portions From a Wine-Stained Notebook (2008), Absence of the Hero (2010), More Notes of a Dirty Old Man (2011) and The Bell Tolls For No One (2015). As reviewed in Bold Monkey, these books collect in a scholarly fashion the best of Bukowski’s previously uncollected poems, short stories and essays. Debritto has also edited for Ecco Essential Bukowski Poetry (2016) which includes about 100 of Bukowski's 5000 or so poems and has published a critical study Charles Bukowski, King of the Underground: From Obscurity to Literary Icon (2013) which carefully documents Bukowski's rise to fame prior to quiting his post office job and writing his first novel Post Office. As a Bukowski tragic, I’ll certainly be having a close look at what Debritto has now uncovered in a decade or more of research. Should be interesting how he structures and sources Buk’s previously uncollected or unpublished work. On another note, I wish John Martin would release his full take on Bukowski’s publishing career & relationship within my lifetime. A timeless selection of some of Charles Bukowski’s best unpublished and uncollected poems Charles Bukowski was a prolific writer who produced countless short stories, novels, and poems that have reached beyond their time and place to speak to generations of readers all over the world. Many of his poems remain little known, material that appeared in small magazines but was never collected, and a large number of them have yet to be published. In Storm for the Living and the Dead, Abel Debritto has curated the very finest of this material—poems from obscure, hard-to-find magazines, as well as from libraries and private collections all over the country—most of which will be new to Bukowski’s readers and some of which has never been seen before. In doing so, Debritto has captured the essence of Bukowski’s inimitable poetic style—tough and hilarious but ringing with humanity. Storm for the Living and the Dead is a gift for any devotee of the Dirty Old Man of American letters.